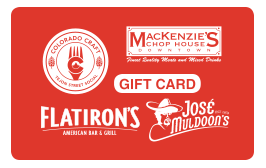 Colorado Craft, both Jose Muldoon’s, MacKenzie’s Chop House and Flatiron’s American Bar and Grill. May be used any time without any restrictions. No expiration date. 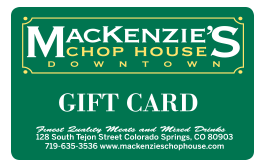 Cards can also be purchased at any Concept location during normal restaurant business hours. How many gift cards would you like? Copyright Concept Restaurants, 2018. All rights reserved.